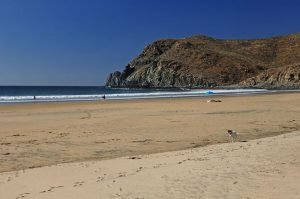 Beach reviews and directions for beaches from Pescadero to Todos Santos, Los Cabos, Mexico. A beautiful, sweeping expanse of pristine beach just south of the farming community of Pescadero. The turnoff is at the top of a hill at about Km. 66. Watch the markers as there is no sign. Drive about 1.7 miles to the beach area. Cliffs are at the western end of the beach with a crescent shaped beach facing the ocean. Formerly called Playa El Estero, this popular surfing beach is called El Pescadero after the fishing village nearby. In season, whales spout near the shore, and mangoes here ripen twice a year. The Golden Gate Bank is just 3 miles off shore, making it easily accessible for small boats. Playa Las Palmas is a smaller quarter mile expanse of beach bordered by a reed lagoon and protected by rock promontories on both sides. Groves of palm trees frame this gorgeous small beach. Ruins of an old rancho are nearby. Excellent area for hiking, swimming and body surfing. Local fisherman launch their pangas in the waves at the local beach several miles outside of Todos Santos. At Km. 53.9 follow a dirt road about 1.7 miles to Playa Punta Lobos. There are several paths that will lead to different sections on the beach where you will spot the landmark rocky promontory and lighthouse. There is a deserted cannery at the beach’s eastern end. 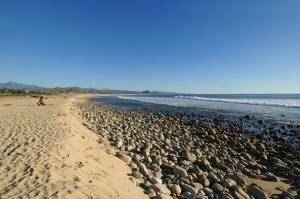 Located about 5 miles north of Todos Santos you find this break by starting in town at the Hotel California. Just east of the hotel look for a road that heads north and when you get to the bottom of the hill hang a left and continue down a dirt road for several miles and keep your eyes out for a small sign for Pastora. Access via the La Cachora road. Suitable for walking, fishing, whale watching, relaxing or sunbathing. La Poza is not a swimming beach. La Poza has a large freshwater lagoon populated that is great for bird watching.